AMES – No. 21 Iowa State secured its first Big 12 victory of the season with a 29-7 victory over No. 23 North Dakota State. The Cyclones (3-1, 1-0 Big 12) won eight of 10 bouts in Fargo, including three by bonus-point margin. North Dakota state fell to 6-4, 2-3 Big 12. At 157 pounds, redshirt junior Chase Straw of Independence put the Cyclones on the board. In a high scoring match, Straw racked up five takedowns against Nick Knutson. He also turned the Bison for a four-point near fall and worked hard on top, garnering 3:34 of riding time in a 17-8 major decision. After Logan Schumacher lost an 11-0 major decision to NDSU’s Andrew Fogarty, ISU redshirt freshman Marcus Coleman jumped out to an early 6-2 lead over Lorenzo De La Riva and held on for an 8-7 decision. The Cyclones added wins prior to intermission from Sam Colbray — who locked up four takedowns during a 10-3 decision over Michael Otomo — and senior Willie Miklus who pinned Cordell Eaton in 2:53. Following the break, Gannon Gremmel kept Iowa State on track in a rematch from the UWW Junior National Freestyle finals against Brandon Metz. Gremmel scored a takedown, earned two back points and rode for 1:55 in a 7-3. Iowa State’s 133-pounder Austin Gomez followed a sudden victory loss by teammate Brent Fleetwood with a takedown eight seconds into sudden victory for a win over Cam Sykora. 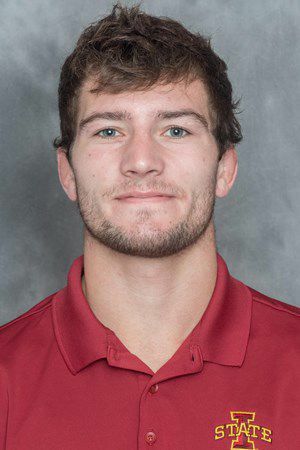 Redshirt freshman Ryan Leisure then prevailed in his Iowa State debut with an 8-7 win over Sawyer Degen, the younger brother of Cyclone 149-pounder Jarrett Degen. It was Jarrett Degen who closed out the dual with a 16-5 major decision against Jaden Van Maanen. Iowa State returns home on Sunday at 2 p.m. to take on Fresno State in Hilton Coliseum. 157 — Chase Straw (ISU) dec. Nick Knutson, 17-8, 165 — Andrew Fogarty (NDSU) dec. Logan Schumacher, 11-0, 174 — Marcus Coleman (ISU) dec. Lorenzo De La Riva, 8-7, 184 — Sam Colbray (ISU) dec. Michael Otomo, 10-3, 197 — Willie Miklus (ISU) pinned Cordell Eaton, 2:53, 285 — Gannon Gremmel (ISU) dec. Brandon Metz, 7-3, 125 — Brent Fleetwood (NDSU) dec. Alex Mackall, 4-2, 133 — Austin Gomez (ISU) dec. Cam Sykora, 8-6, 141 — Ryan Leisure (ISU) dec. Sawyer Degen, 8-7, 149 — Jarrett Degen (ISU) dec. Jaden Van Maanen (NDSU), 16-5. 157 -- Chase Straw (ISU) dec. Nick Knutson, 17-8, 165 -- Andrew Fogarty (NDSU) dec. Logan Schumacher, 11-0, 174 -- Marcus Coleman (ISU) dec. Lorenzo De La Riva, 8-7, 184 -- Sam Colbray (ISU) dec. Michael Otomo, 10-3, 197 -- Willie Miklus (ISU) pinned Cordell Eaton, 2:53, 285 -- Gannon Gremmel (ISU) dec. Brandon Metz, 7-3, 125 -- Brent Fleetwood (NDSU) dec. Alex Mackall, 4-2, 133 -- Austin Gomez (ISU) dec. Cam Sykora, 8-6, 141 -- Ryan Leisure (ISU) dec. Sawyer Degen, 8-7, 149 -- Jarrett Degen (ISU) dec. Jaden Van Maanen (NDSU), 16-5.